BMW M4 Performance, Engine, Ride, Handling | What Car? The M4 is a powerful car that’s capable of cornering at impressive speeds. It has a huge amount of front-end grip, doesn’t roll in corners and responds to steering inputs very quickly. The steering is heavy enough, but it doesn’t give much natural feedback. The adjustable suspension can be made firmer when you’re driving harder, but in any mode the car is agile and precise. There’s not a great deal that’ll keep up with the M4 in a straight line. The twin-turbocharged 425bhp straight-six engine pulls strongly, even in higher gears. However, while from outside it sounds great, from where you sit it's harsh and loud. Choosing the wind-in-your-hair approach does – as usual – come with a weight penalty; the drop-top is 200kg heavier than the M4, in part because of its complex folding metal roof. This means it takes a little longer to hit 62mph in a sprint, but you'll rarely notice it on the road. A six-speed manual gearbox is standard but we’d recommend specifying the optional seven-speed, dual-clutch automatic. It allows you to make far better use of what the quick-revving engine has to offer, thanks to its reliable and lightning-quick gearshifts. It also makes the car a little more easygoing in traffic and around town. The launch control system can be very fiddly to use, though, and doesn’t restrict wheelspin as well as some rival systems. The M4’s ride is firm, but it's tolerable for a car of its ability. There’s lots of road noise at motorway speeds, however, so long drives can become a little tiring. The only downside to the BMW’s outrageous capabilities is that it has to be driven aggressively and fast before it gets exciting and involving. It’s not like the thunderous Mercedes-AMG C 63, in which you can amble around at lower speeds and just enjoy the bellow of its V8 engine. Reign in all the various drive modes, and cruising in the M4 Convertible with its metal roof closed is a relaxing experience, because there's very little wind or road noise allowed inside the cabin. It's also impressive with its roof down. There's little buffeting when its four windows are up and almost none with its optional wind deflector fitted across its rear seats. The deflector is easy to put in and take out, too. 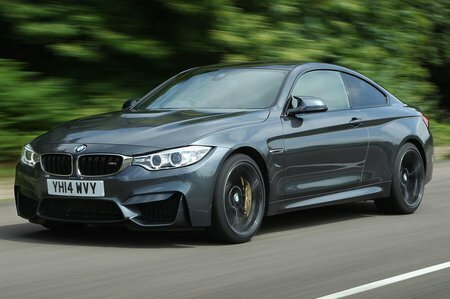 For around £3000, BMW will fit the coupé with a Competition pack to your M4. It increases the power output by a modest-sounding 19bhp, the sports exhaust is retuned to be rortier - and the alloys grow to a dimension of 20in. It’s a worthwhile extra, helping make the M4 not only slightly quicker, but more stable at the same time without hurting its ride quality.